Kitchen nostalgia | Lisa Hughes Long's Kitchen...and More! The tenderness and moistness of this cake make it beyond compare – like a cloud. It has been a family favorite for decades and has served as a basic recipe for coconut cakes, lemon-orange cakes, cupcakes, birthday cakes…even wedding cakes! It is typically baked in a sheet pan, but also works perfectly when layered with lots of delicious icing. Be sure, though, to handle super-gently if placing on a stand and frosting, since the very delicate texture has a tendency to crumble. If you are a fan of a Southern favorite – black walnuts – nothing provides a better, buttery batter for traditional black walnut cake than this recipe. Especially when topped with fluffy, boiled coconut frosting. Too good!!! Prepare a 13 x 9″ oblong baking pan or 2 9″ layer cake pans by greasing and lightly flouring. Preheat your oven to 350 degrees. Beat together until light, fluffy and silky. Pour into pans, spreading evenly and bake approx 35 minutes, or until cake passes the “toothpick test”. It will be golden on top. Allow to cool in pan for at least 15 minutes before removing due to the fragile consistency. This recipe is sure to become a family classic to all that give it a try. It’s versatility is unsurpassed! A snack, a condiment, a meal! I was lucky enough to have been born in the 1960’s, when “artificial” food was hot and happening. We wanted all we could get – from Pillsbury Space Food Sticks to Carnation Instant Breakfast. A Swanson or Morton’s frozen dinner was an exciting treat – no matter how bad it tasted! This is all but a lead-in to the product that is on my mind today – the imitation bacon chip. Actually, flavored, colored, and heavily salted soy protein pieces. They, like saccharin, are such an ingrained part of my childhood, even now, I can’t let go. My first experience with the “bacon” bit was in the Metropolitan D.C. area with my best friend and her parents. We were seven at the time. The restaurant was “The Joshua Tree.” Famous for pitchers of Sangria and huge baked potatoes accompanied by an array of “fixin’s” featuring tiny burgundy colored squares that you “couldn’t tell from bacon”. You could tell them from bacon. But no one seemed to care. They were cool. Cutting edge. Vegetarian. 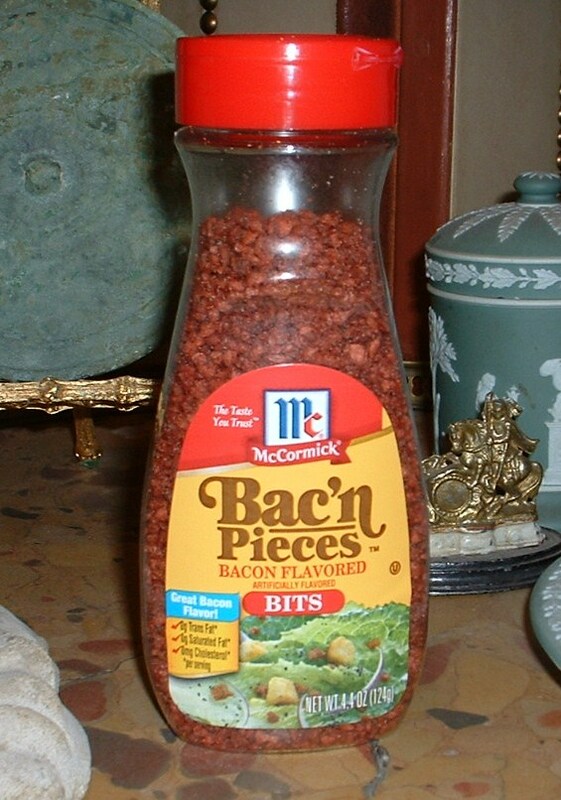 Bac-o’s, Bacon Bits, Bac’n Pieces…I still love them all, but try to practice restraint. Their only drawback (aside from nutritional content) is a tendency to lose their original “crispiness” shortly after opening. And just when you think you have a problem… Simply store a shaker of BB’s in the freezer and they stay fresh for months. They pour beautifully and retain that addictive and delicious crunchy texture, all the while, never tasting anything like bacon. But who wants to worry over such trivial issues? Football-sized baked potatoes (usually in foil), ice cream scoops of fluffy, yellow-colored imitation butter, dried chives, whipped sour cream, and, of course, “bacon” galore…those were the days! Growing up in the 1960’s, processed food was not avoided, but encouraged, and we took advantage of its deliciousness at every chance. In my home, a favorite sandwich ruled, one which involved only three ingredients – the Mayonnaise Fancy. While the ingredients were few, they were three very special ingredients. The assembly of the sandwich was not to be taken casually, and the accompanying beverages were key to the success of the “Fancy”. And, of course, presentation played a major part in the simplistic perfection of this delicacy. 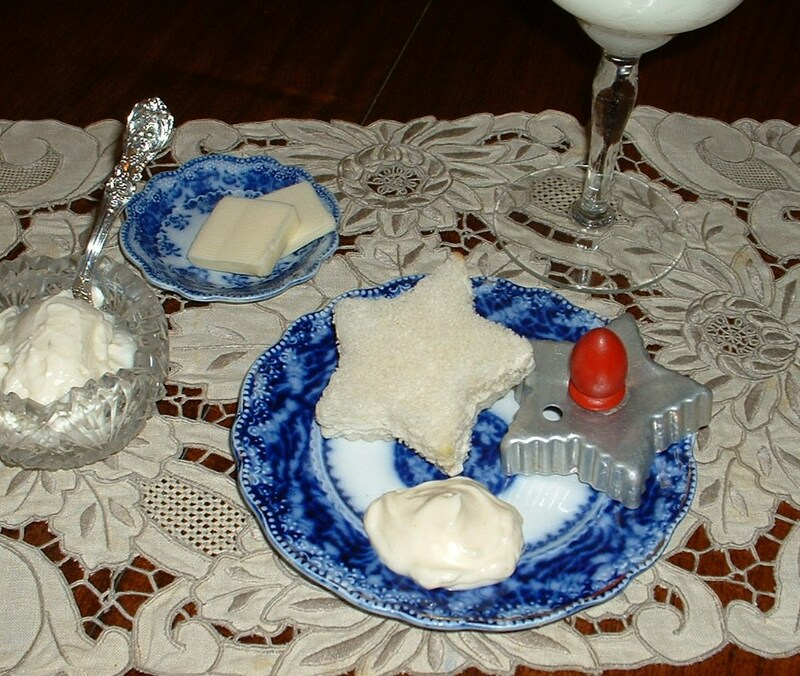 The “Mayonnaise Fancy” was as basic as it gets – cheap white bread, mayonnaise, and butter. That’s it. Bread, mayo, butter. The bread had to be fresher than fresh. Preferably the store “house” brand and almost gummy in texture. First the bread was cut into a desired shape with a cookie cutter (we liked stars and hearts… sometimes horses) to “seal” the edges and add style, or fanciness. No trace of crust allowed! The cut-outs were generously buttered before being spread with a thick layer of mayonnaise. Only one brand was ever used – Hellmann’s (Best Foods on the West coast) – ample amounts required. When all was finally brought together into a sandwich – Voila! – magic on a plate. The Mayo Fancy was generally served with ice-cold whole milk. However at holiday time, when cut into tiny shapes, with itty-bitty cookie cutters, it was magically transformed from just a sandwich, into an elegant hors d’oeuvre – and tasted all the better accompanied with Brut Champagne! But then, what doesn’t? Cover and allow to cook for 10 min. Stir occasionally. In separate bowl, beat egg and slowly add a small amount of heated milk mixture to temper egg and avoid separation; then gradually whisk egg – milk mix into double boiler and cook for 3 – 4 minutes over hot, not boiling, water, stirring constantly. This should render a thick, smooth pudding. Remove from heat and add butter and vanilla; allow to cool slightly – to about room temperature. Slice 2 – 3 bananas evenly into baked shell. Make sure your bananas are perfectly ripe, yet firm. Pour cooked pudding mixture over bananas, all at once. Chill for 1+ hours – until completely firm. Spread coconut on baking sheet and toast in 350 degree oven for approx. 10 minutes or until lightly browned. (Be sure to check frequently!) Stir from time to time. Remove when golden brown. Just before serving, whip whipping cream. Add confectioner’s sugar and vanilla to taste. Spread a thick a layer of freshly whipped cream over chilled pie – covering pudding to the edges, evenly. Peel remaining banana and slice into rounds. Arrange slices attractively all around the edge/crust. Sprinkle toasted coconut generously in center of pie, and lightly on plates before presentation. I like placing a few pieces of banana on the plate as well. The more the merrier! Makes 6-8 servings…sometimes. It’s Saturday afternoon and I just dropped a completely stripped carcass of Thursday night’s Thanksgiving turkey into the trash. There wasn’t a scrap of meat or stuffing left. Ah, the carnivorous joy of leftovers and picking the bones – finding a hidden shred of meat (sometimes white!) or an undiscovered spoonful of dressing. This elation brought up a thought that has plagued me for years. 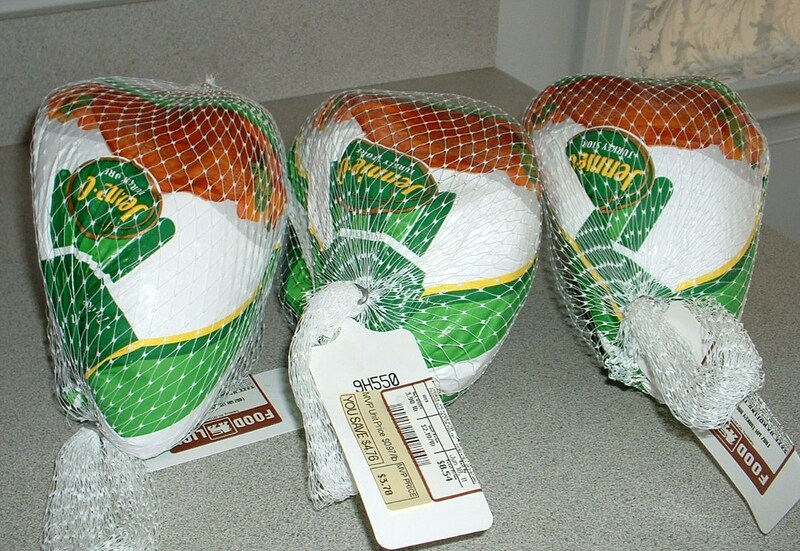 Why, when a turkey is such a thrilling experience for most of us, and isn’t always that much bigger than a chicken, do we deny ourselves until Thanksgiving? It certainly isn’t expensive or difficult to cook. A very healthy protein. What’s the problem? The only answer I could derive was that we don’t want to tarnish the “specialness” associated with Thanksgiving. We all roast (or fry) this “giant chicken” that makes quite a show and it seems all too much for day-to-day life. Turkey is larger than life ! My dad was once the leading producer of turkeys in the U.S. Back in the Dark Ages. He was famous for being the “turkey grower who didn’t eat turkey”. He didn’t. In those days the birds roamed free on the range – no houses. Out in the open. They were driven like cattle from farm to farm. It was a hard business. But even in my home, I never remember the concept of “everyday turkey” ever discussed. It’s now being worked into our diets through products like bacon, sausage, and hot dogs, but still, no one is pushing cooking the whole bird except on Thanksgiving. Perhaps it seems anti-American. Just too much of a break in tradition to handle. I guess we do have to keep some special things special. I’m just sorry it had to be turkey. Life really is too short. 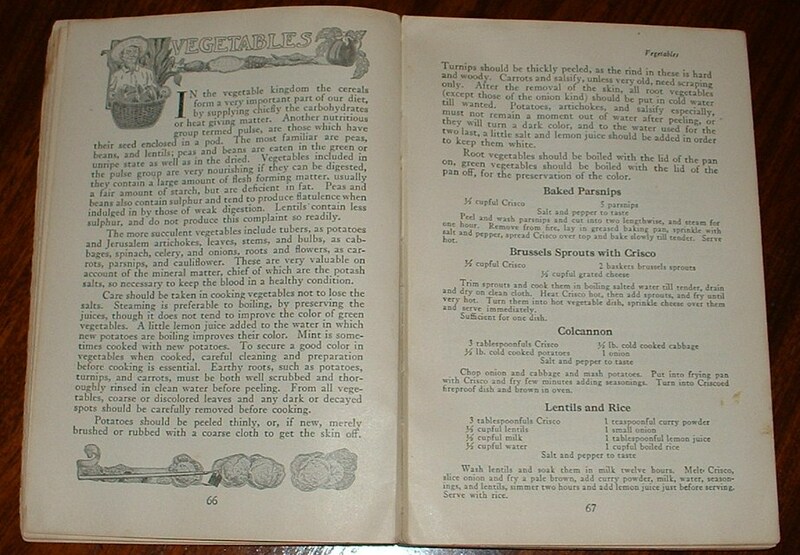 This recipe is another contribution from Mary Lou Hitt, Genlue Park, Browntown, Virginia. 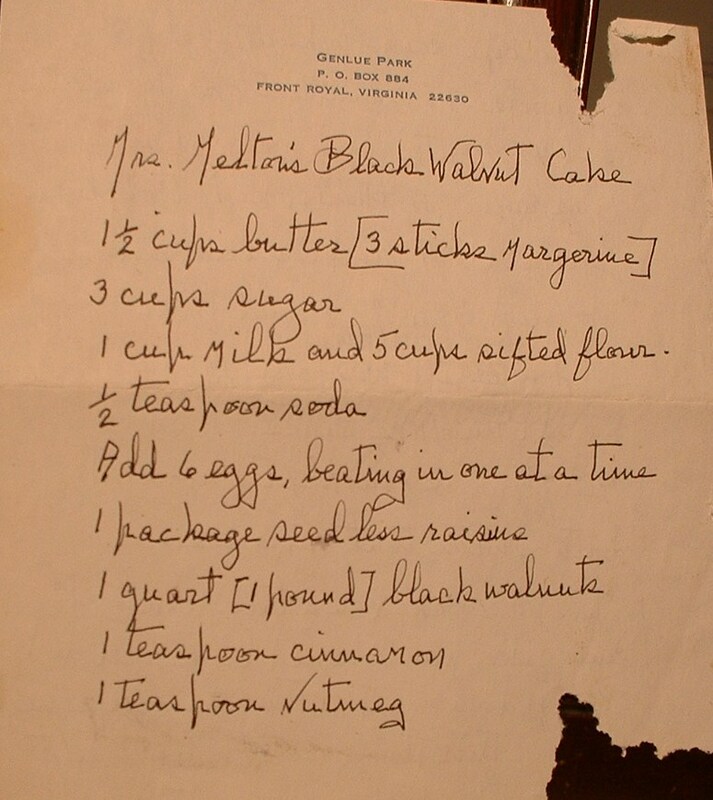 Her handwritten recipe is torn, and missing a little of her instructions, but sounds marvelous, nonetheless! “….recipe said – bake at 275 degrees for 1 1/2 hours. It actually took 2 hours and 45 minutes in a well-regulated gas oven for this cake to test done. I could not find “seedless” raisins, so used “Sun Maid” and those packages are now only 15 ounces, so add another ounce. All flour is now sifted so don’t bother with that nuisance. While the instructions are limited, I remember everything Mary Lou baked as being superb. She had an aversion to salted butter and loved exotic recipes. She was the first person I ever knew to have cooked Mexican fare, having lived in San Antonio, Texas in her youth. I think this cake is rather simple – cream butter and sugar, add milk, eggs, then slowly add in dry ingredients. Bake. Allow to cool on rack. And I double-checked. She really did say that it took 2 hours and 45 minutes for this cake to be done. ( No typo.) I’d still check it from time to time with a broomstraw or toothpick – better safe than sorry. I’m looking forward to trying this, too. Her handwritten “receipt” was just discovered this week , folded in my grandmother’s cookbook from the 1950’s. In the South, black walnut cake is such a Christmas tradition. Great dessert to make for the holidays! I’d top it with homemade whipped cream, Rum Raisin ice cream, or hard sauce. Anyway you slice it (or top it) – delicious! …”too heavy to lift without adequate staff.” 🙂 !! More recipes from "A Calendar..."
Hidden far back on a shelf in my kitchen, I discovered a destroyed cookbook. The pieces that remained were sealed in a zip-lock bag. It first belonged to my great-grandmother, Clara Hughes Richardson, otherwise known as “Mud,” who was into healthy living and cooking; following the advice of Gaylord Hauser and Edgar Cayce. Over the years, the book worked its way through the family down to me. After doing a little research, I discovered that I was the owner of the original Crisco bible – “A Calendar of Dinners” – featuring 615 recipes. It was written by Marion Harris Neil for Proctor and Gamble and printed in 1913. History of this “new grease” (originally named “Krispo”) and the excitement associated with it was detailed in the book’s beginning. One paragraph entitled, “A Need Anticipated,” documents the desperation in the U.S. for an alternative fat. Crisco, being a pure “vegetable oil” was the answer! “Great foresight was shown in the making of Crisco,” they said. Brief, “Interesting Facts” were listed, among them being Crisco’s appeal to hospitals for its health benefits, its use in home economics classes, how it had become a favorite for hikers, as well as being a must in every Kosher kitchen. It was a big hit on ocean liners! Crisco, sold only by net weight, came in a can that was treasured by housewives for canning fruits and vegetables. And then there were the recipes…oh, the recipes. *Orange Pie – Line pie tin with Crisco pastry. Beat yolks of 3 eggs with 1 cup sugar til light; add 1 tablespoon cornstarch, 2/3 cup milk, grated rind and strained juice of 1 orange. Place in double boiler and stir til it thickens, then pour on to crust and bake 30 minutes. 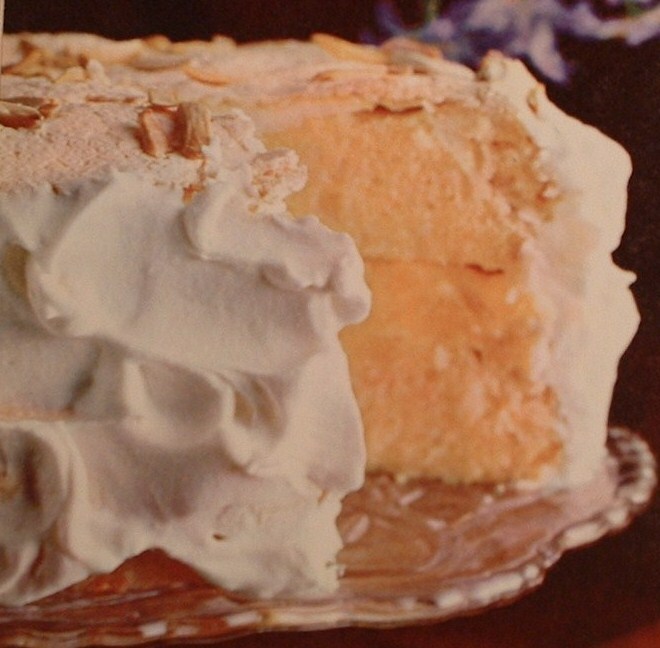 Cover top with meringue made with whites of eggs and sweetened with 3 tablespoons sugar and flavored with 1 teaspoon orange extract. Place in oven to brown. Sift flour and salt and cut Crisco into flour with knife until finely divided. Finger tips may be used to finish blending materials. Add gradually sufficient water to make stiff paste. Water should be added sparingly and mixed with knife through dry ingredients. Form lightly and quickly with hand into dough; roll out on slightly floured board, about one-quarter inch thick. Use light motion in handling rolling-pin, and roll from center outward. Sufficient for one small pie. Orange Pie is one of the recipes that has a big “X” scribbled to the side, indicating that it was one of Mud’s favorites. 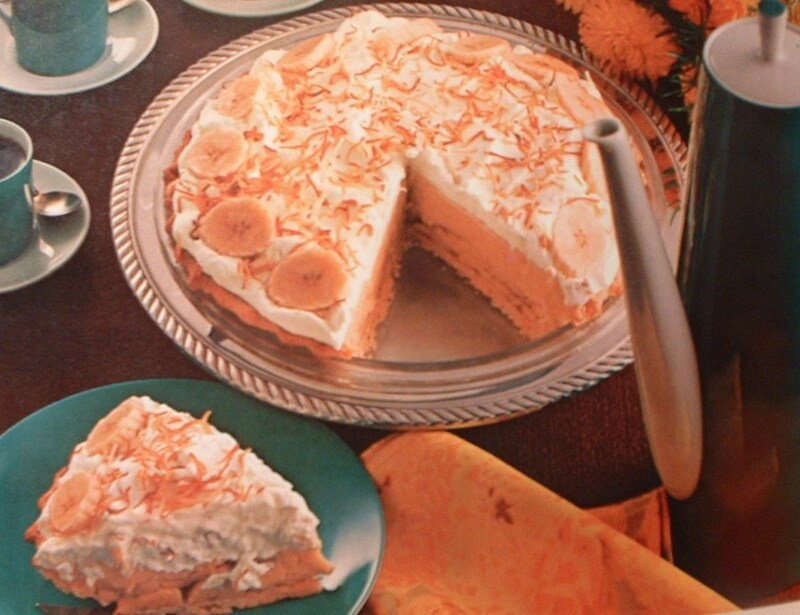 When Halloween rolls around, and you’re trying to think of an orange-colored dessert other than pumpkin pie, maybe this deserves consideration. But then again, maybe not. Unlike the original formula, which was primarily hydrogenated cottonseed oil, Crisco today is produced by Smucker’s and is trans-fat free. While still not exactly a health food, it is far better than it was. …and if anyone can figure out the statement about the teaspoon and the wagon, please be kind enough to let me know.